Since you are tired of traditional glamor, you will be happy with extraordinary and effective dark gothic we’ve prepared for you. Gothic will be a neat decision for distinguished brides who have an accurate taste and love opulent lacy designs (like in boho wedding dresses). A diversity of wedding styles in gothic frees the space for your glory. 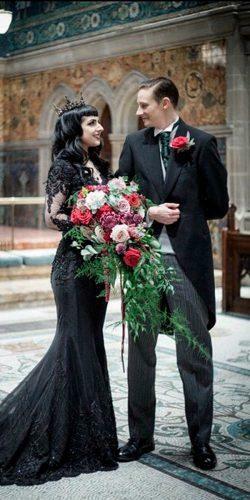 Here you may browse out the compilation of best gothic wedding dresses! Check out selected wedding styles below and you will find the one alternate suit in dozens of variants. Refined details and a gentle lace emphasize on the elegance of gothic. Moreover, extraordinary designs of goth prom dresses are popular even at the present time. They will extremely well fit our wonderful brides. From thousands of dresses of black gothic brands, we have formed the vivid compilation of the most successful ones. So, pin one of these not to forget this very notorious style. You will be at the height of your marked party in such clothing. Express real passion and goodliness with exceptional focal patterns and azure motives. Imagine your love story as an ideal movie with fabulous movie stars. Rich materials and facets cushioning the body have fantastic views. 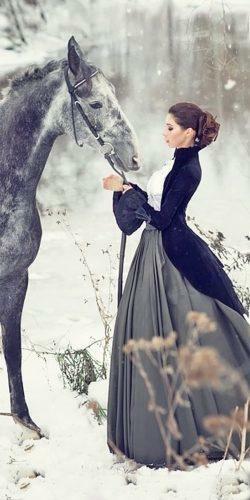 After all, the best models of dresses create splendid influence. Beautiful A-line silhouettes make your art more thin and seductive. The different stylistics of vintage inspired wedding dresses crafts a dazzling nuptial costume. For instance, airy facets resembling nightgowns won’t leave you boring. Turn the night to your side. Tight gowns and brisk nuances make bride glowing on her party. For you can denote a significant occasion with a brilliant solemn costume. A few accessories in the wedding outfit bring some charm — and you will glow beautifully on your dark-styled wedding! A fabulous style that expresses lovely and marvelous outlook for the wedding dress is a ball gown. Wear it in stylish expressive colors of red and black colors. In particular, plus sized wedding dresses possess many samples of this style. From the other side, stunning deep crimson, scarlet or flavor hues or red dazzle your imagination. Conjoined with a coarse black, they picture a terrific outlook. Profound colors of black and red play gorgeously on its a contrast. Thus, you will easily gain luxurious look wearing samples like these. 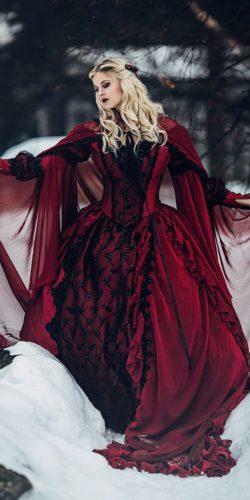 So, imagine how superbly coming of your party in a gothic style which matching with black and red colors. Also, purple gothic wedding dress deeps truly veri-table sentiments. Whether you will choose a decorated or plain and draining bodice, your choice wanders around creativeness. So, the length that is glowing down pictures you as a vivid bride. 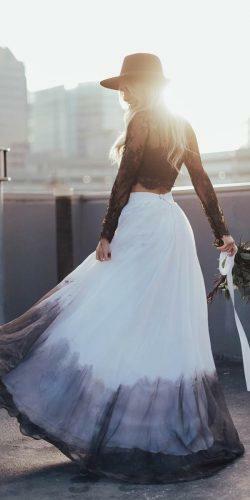 Ballerina skirts which cover even your ankles make you resemble royals. 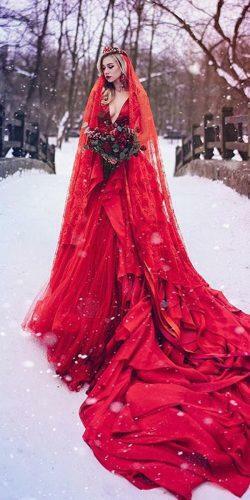 Obtain light carroty or deep scarlet color for your gothic wedding dress avoiding black. Signify a victory of your dedication in red trendy colors. Vermillion and carnation with full-length skirts show passion. Delicious colors and fork-rank cut are the best options to be sensible. 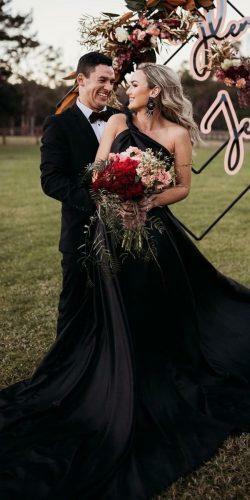 In addition to it, fashion red and black wedding dresses dazzle. They turn you into an excellent woman with brilliant flavor. In conclusion, a festivity decorated in gothic black and red appeals with its shadowy charm. Power the mastery of the real beauty. Zingy navy blue makes you a master of fashion. After all, it emphasizes your individuality with essential details. Grey shadowed pallet-bed for your dress benefits them with saturated tints. Due to it, you will find something suitable for you individually. Yet express your mind through a little sundry peculiarity. For example, frantic twigs that you may plug into a bouquet surprise with an effective gesture. Are you tired of bored cliché? 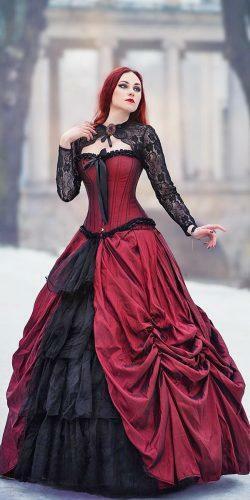 Then fascinating gothic Victorian dresses are what you need. Whenever or not Victorian wedding dress style will make you look fantastic, beach wedding dresses are always a happy decision for an alternate style. Openwork facets wrapping up the dress to the end enrich the style, adding their own genuine line. These designed wedding gowns won’t leave any heart cold. 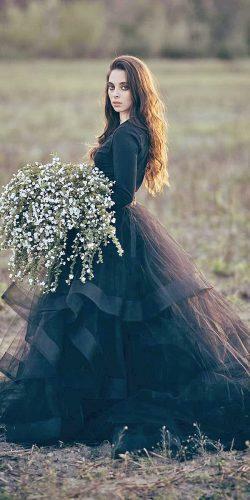 Use the allurement of the night and bewitch all your guests. Here you will gain a pick of everyone’s emotions with long-tail or short-tail skirts. Torn hemlines look effective from time to time. Reach the highest degree of attractiveness with creative gothic ball gown skirts. In addition, such splendid decision demonstrates your taste and rich inner nature. Dominion of true style finds itself in top dresses obtained a dark design dresses in gothic. 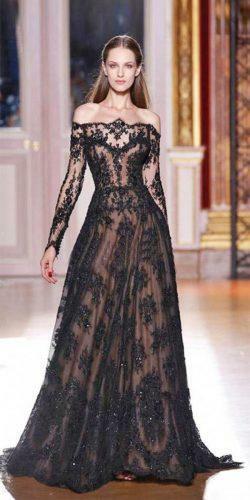 You will mark your incredible day as a shiny star, for black gothic dress makes you look splendid on your wedding day. Wizard charm of black marriage befits to cool gals and favorable men. Sparkling el-ements on the skirts hit the goal. And all wouldn’t turn off eyes from your expressive appearance. Supposing it possesses a range of styles, you choose from high or low lengths to scattering flounce skirts. Seducing front slit with decorated hem is accurate, and a dollop of seductive lace will turn you in a queen lady. Deep black creates a dramatic vision that fills with endless enchanting. As you are searching for a real peculiarity, try white gothic wedding dress. With them, you’re different from others with unique snowy vintage.